1. Granting scholarships to needy pupils and particularly to enclaved Cypriot pupils. 2. Carrying out special studies for the evaluation of educational programmes. The production and distribution of educational videos and CD-ROMs accompanied by printed material. 3. Contributing to the effort to eradicate violence in sports. 4. Making studies and pilot programmes for the training of adults. Publications about teaching the Greek language to Greeks overseas. In addition, through a systematic and well-founded approach, the Athanasios Ktorides Foundation focuses its attention on cultivating and promoting the ideal of “Fair Play” in the spirit and the soul of young people and the universally recognized fundamental values it encompasses. Fair Play is a positive notion. It integrates the ideals of friendship, dignity, respect for the others, good conduct and equal opportunities. The Athanasios Ktorides Foundation supports the idea of “Fair Play” which should be present everywhere in all forms of sports, regardless of the age of contestants. The Foundation makes its own contribution by helping young people develop characters with a profound sense of communication and cooperation. By providing opportunities and incentives to develop critical thinking, the Foundation helps the new generation of athletes and their supporters to develop a keen sense of responsibility and integrity so that sports and society as a whole can move towards a better future. On 10 October 2010 the Athanasios Ktorides Foundation successfully organized the first Marathon in Nicosia called the “Quantum Nicosia Marathon”, all the proceeds of which were given to the following charities: “Make a Wish”, the Cyprus Anti-Cancer Society and the Old People’s Homes of the Nicosia Municipality. Also on the day of the Marathon, a philanthropic “TELETHON” fair was held at the moat of the Nicosia Walls, the proceeds of which went to the Cyprus Institute of Neurology and Genetics. 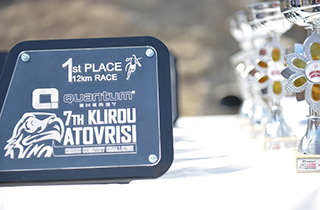 The Quantum Nicosia Marathon 2017 will take place on Sunday 3rd of December 2017. For additional information visit: www.nicosiamarathon.com.